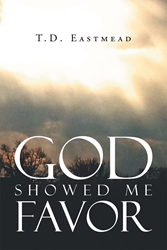 “God Showed Me Favor” from Christian Faith Publishing author T.D. Eastmead takes readers on a spiritual and emotional journey as they work their way through the touching collection of works. “God Showed Me Favor”: a brilliant collection of poetry covering a variety of topics that display the author’s skill. “God Showed Me Favor” is the creation of published author, T.D. Eastmead, a mother from New Jersey with a passion for literature and God. “The ones from the girls she used to call her friends. from some of the older men. like she was never one to live a life of sin. gets close enough they just stay quiet and grin. Published by Christian Faith Publishing, T.D. Eastmead’s new book showcases the variety in the writings of the author across a multitude of themes and topics. Through these writings the author shares important ideas that can be applied in the reader’s life. These poems come alive and vividly display the passions, pains, and experiences of the author in a moving manner to give readers a better something to think about and maybe apply to their own lives. View a synopsis of “God Showed Me Favor” on YouTube. Consumers can purchase “God Showed Me Favor” at traditional brick & mortar bookstores, or online at Amazon.com, Apple iTunes store, Kobo or Barnes and Noble. For additional information or inquiries about “God Showed Me Favor”, contact the Christian Faith Publishing media department at 866-554-0919.